Birankai North America is a 501(c)(3) nonprofit organization dedicated to improving the lives of its members through the practice of martial ways (budo) as exemplified by Aikido, Weapons, Iaido (the study of the Japanese sword), and Zazen meditation. For our full values, mission, and vision, click here. BNA prides itself on its standards for teachers and members. Read our ethics statement here. Birankai North America is a part of Birankai International, an organization established by T. K. Chiba in the year 2000. Chiba Sensei had led the Western Region of the United States Aikido Federation since his arrival in the U.S.. In 2006 Birankai North America was established as a separate organization from the USAF, and many of the dojos that had been in the USAF Western Region became members of BNA. Birankai North America-U.S.A. received official recognition from the Aikikai Hombu Dojo in Tokyo in May of 2009. As of 2016, there are 54 dojos affiliated with BNA: 51 in the U.S. and 3 in Canada. While Birankai Canada received official recognition in its own right from the Aikikai Hombu Dojo in 2014, Birankai Canada, its dojos and members also maintain membership, and continue to participate fully in the activities of Birankai North America. Birankai International, which was established in 2000, brought schools under Chiba Sensei’s aegis in Europe, Britain, and North America together under a single umbrella organization to support their training. In 2001, Chiba Sensei wrote this account of the formation of Birankai International. Birankai International currently includes Birankai North America, with dojos in the United States and Canada, Birankai Europe, with dojos in France, Austria, Germany, Poland, Greece and Israel; British Birankai, with dojos throughout Britain; and Scottish and Borders Birankai, with dojos in the northern U.K.
• BNA offers access to high-level Aikido instructors. Birankai members have access to a wealth of highly skilled and qualified Aikido instructors, many of whom trained directly under T. K. Chiba Shihan for a number of years. Chiba Sensei’s lineage has gained a reputation throughout the larger Aikido community for its rigor, particularly in the area of weapons training. BNA dojos in general, place a high priority on physical conditioning and weapons proficiency. Many BNA dojos offer training in Iaido, Zazen, and/or Misogi, in addition to Aikido study. All BNA instructors must meet the organization’s certification standards and are expected to demonstrate their continued progress in the art on a regular basis. Furthermore, Birankai members are welcomed, and will find familiar training, at any of the organization’s 54 dojos, as well as at dojos affiliated with the United States Aikido Federation. • BNA is directly affiliated with Aikikai Hombu Dojo in Japan. • BNA provides seminar support to member dojos and regional events and provides training scholarships to members. For more information on BNA’s seminar and scholarship programs, click here. • BNA offers training materials through its online store (temporarily unavailable) and published curriculum guidelines. • BNA is an inclusive community of Aikido practitioners. Birankai North America welcomes people of all ages, abilities, beliefs, incomes, races, nationalities, genders, and sexual identities. Read testimonials here. Information on how to become a BNA dojo can be found here. 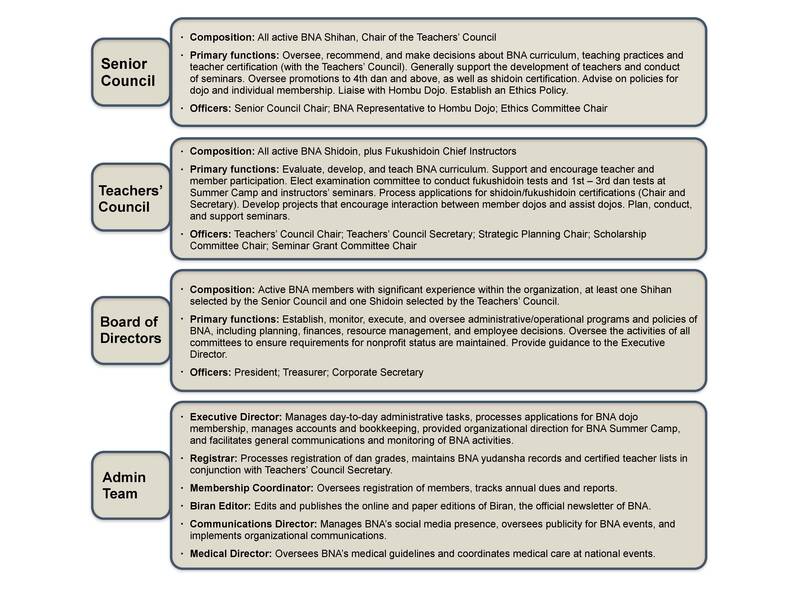 BNA is governed by three equivalent bodies: The Senior Council, the Teachers’ Council, and the Board of Directors.